1. Terrain – Straight Edge Planter: I’ve been on the hunt for an outdoor planter that’s as plain as possible. You can’t get any more simple than this fiber clay cube! 2. West Elm – Outdoor Hand-Drawn Stripe Pillow: Red stripes, as far as I’m concerned, go with everything. 3. Dot & Bo – Rustic Tree Swing: Every yard needs an element of fun! 4. Wayfair – Adirondack Chair: I’ve had my Oxford Garden Shorea table and chairs for 16 years and they’ve held up and weathered beautifully. 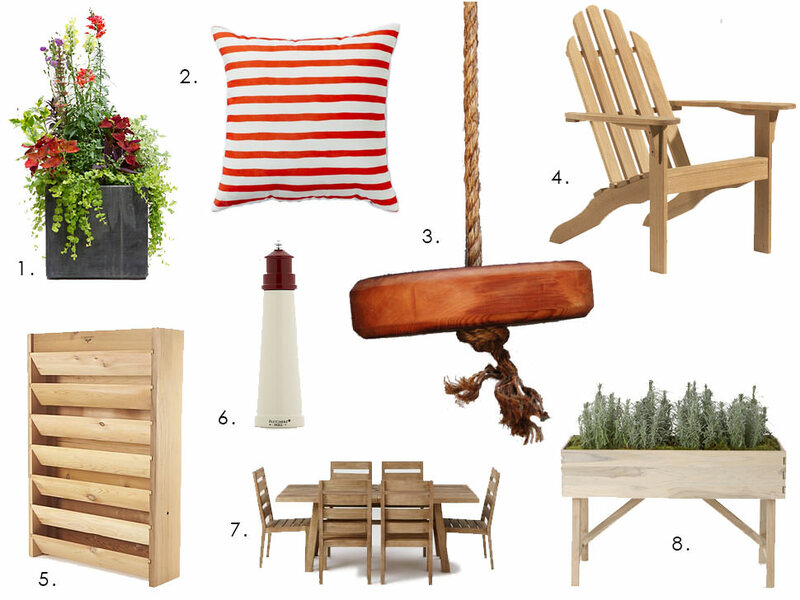 This adirondack by Oxford Garden is a bit less expensive than most teak options. Be forewarned, Shorea wood is heavy and the chairs are shipped knocked down. 5. Crate and Barrel – Gronomics Vertical Garden: I’m so intrigued by these vertical gardens…sort of like live art for your outdoor walls! 6. Crate and Barrel – Lighthouse Pepper Mill: The perfect summer hostess gift, but wouldn’t mind one gracing my picnic table. 7. West Elm – Jardine Expandable Dining Set Table: I love the classic styling of the Jardine line, plus it’s a super reasonable price for an outdoor wood dining set. 8. Terrain – Raised Teak Trough Planter: Fill this pretty planter with herbs and you’ll never have to bend down!